Brown rice is a good source of health-beneficial nutrients such as fiber, phytochemicals and essential minerals. Organic brown rice may possess more health benefits than conventionally-grown brown rice, as certified organic products, compared to conventional food crops, contain lower levels of agricultural chemicals that may harm health; however, there is no concrete evidence that organic foods are more nutritious than regular foods. Brown rice is high in nutrients, while low in calories, making it a very healthy food. Brown rice is a whole grain that can be used to meet the USDA's dietary recommendations of three daily servings of whole grains -- each 1/2 cup of brown rice is equal to 1 serving of whole grains. Whole grains like brown rice are rich in fiber, which may reduce heart disease and risks for certain cancers, while also promoting good digestion and a healthy weight. 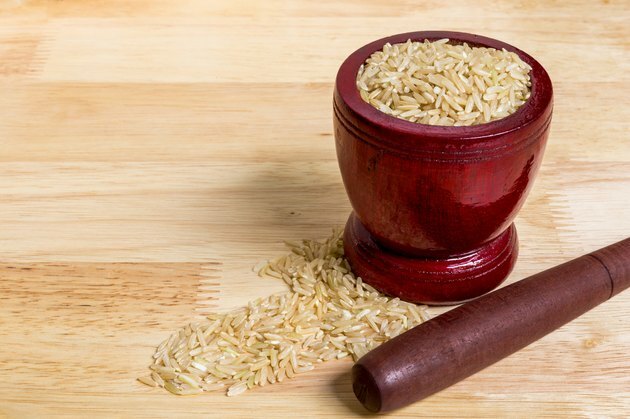 Brown rice is also rich in essential minerals including magnesium and manganese, as well as bioactive phytonutrients such as lignans, phytoestrogens and phenolic compounds. Furthermore, brown rice is a gluten-free food that contains no trans fat or cholesterol and only trace amounts of fat and sodium. Eating organic brown rice may confer additional health benefits compared to eating non-organic rice. It's not yet clear whether organic foods are unilaterally more nutritious than non-organic foods, but they do contain less pesticides and food additives. Compared to organic food crops, conventionally-grown crops contain significantly more pesticide residues, which, depending on the type of pesticide and your level of exposure, may harm health. Organic foods, such as organic brown rice, are also less processed than non-organic foods, meaning they contain less artificial colorings, flavorings, sweeteners, and preservatives, some of which are thought of as harmful to your health. Rice, in particular, loses health benefits during processing -- when its outer husk is removed during the refinement process, the rice loses fiber content. Besides the potential health benefits of organic foods, some people buy organically-grown foods, including organic brown rice, for environmental and other reasons. Organic farming practices help benefit the environment by reducing pollution from agricultural chemicals and conserving water and soil quality. Organically grown foods also have a smaller carbon footprint than conventionally-grown foods; according to Organic.org, organic farms use, on average, about 30 percent less energy than conventional farms. Moreover, some people prefer the taste of organic foods to conventionally-grown ones. If you want to make sure you are buying certified organic brown rice, it's important to pay attention to the label. For example, just because a food is labeled as "natural" doesn't mean it's organic -- only foods that are grown and processed according to USDA organic standards can be labeled organic. These foods will display an official USDA seal certifying that the product is organic. A common downside with organic foods is cost, as organic foods may cost significantly more than their conventional counterparts. To avoid digestive problems, such as gas or bloating, from eating high-fiber foods such as brown rice, it is important to drink plenty of water. What Are the Effects of Eating Raw Rice?